IT may be assumed to be a generally accepted proposition that every creature has its own appointed use and purpose, and has its place in the whole scheme of creation; yet it is also true that we constantly hear animals,—beasts or birds,—spoken of as belonging to one or other category of the noxious or innocuous. We have indeed a somewhat unpleasant word to designate the former, a word that has travelled far from its original meaning; we call them ‘vermin.’ When, however, we give the matter closer consideration, it will be found by no means an easy task to draw hard and fast lines separating, as it were, the sheep from the goats. We find it to be a matter of proportion, circumstances, and surroundings, just as ‘dirt’ was properly described as matter in the wrong place. In India, in districts where game is still plentiful, the tiger is looked upon by the native cultivator as a benefactor who keeps down the wild animals that devastate his fields; but when game is scarce or non-existent, and the tiger preys systematically on his cattle, he is addressed with opprobrious epithets, and the assistance of the Sahibs is invoked for his destruction. Here in our own country we have got into a way of loosely classing certain beasts and birds as 'vermin,' to be destroyed in every way possible without further trial, and of this habit it may be of interest to consider a few examples. To turn to another of our larger carnivora, the badger, this is a long-suffering animal which, on account of ignorant prejudice, has been so persecuted that it is now rare in Scotland, although comparatively plentiful in some districts of England, where its harmlessness is probably better understood. An omnivorous feeder, living on roots, vegetables, fruits, beetles and insects, reptiles and mice, with a special love for honey and wasp-grubs, he is decidedly useful on the whole; his fondness for an occasional change in the way of a nest of young rabbits being about the sole charge that can fairly be brought against him. The case of the otter, the next of our larger animals, is not quite so plain. Where fish are plentiful his diet consists almost entirely of them, and at times he destroys more than he consumes. In his favour it is to be recorded that eels are a special favourite with him, and there is certainly no worse enemy than the eel to salmon and trout in their early stages. When fish are scarce, the otter contents himself with frogs, young rabbits, indeed with anything he can come by. There is on the whole, therefore, not very much to be said in his favour; but his mode of life and nocturnal habits enable him to take pretty good care of himself; indeed the otter is more plentiful than many people imagine, and there is not much fear of his extermination for a long time to come. It must be conceded that it is difficult to make much of a case in favour of the wild cat on the score of usefulness, under present-day conditions ; their numbers, however, are now so few that they can do little damage in the wild and remote localities where they still exist. A few mountain hares or grouse are surely not too high a price to pay for the continued existence of such a magnificent type as a member of our Scottish fauna. Much the same is the argument in favour of a lenient judgment of that beautiful and graceful animal, the marten, which one fears is still nearer to the vanishing point. Like the wild cat, and unlike the otter, they are easily trapped, and the only hope for them is that some of our larger proprietors may extend protection to them in time. For the polecat, one fears that it is already too late to put in any plea ; but if, as seems probable, our tame ferret is a domesticated race of the polecat, it is likely to be with us in this form for many a day. In the case of the stoat there is much more and stronger evidence for the defendant. It cannot for a moment be denied that it is a some what dangerous neighbour for game of all kinds, yet it must be kept in mind that the stoat is a determined foe of the rat, as well as of the lesser rodents generally, and the rat is perhaps the worst enemy of all, both to the game preserver and to the farmer. The growing plague of rats is becoming a very serious, and even threatening evil, and it may be fairly urged that the stoat in moderate numbers is, on the balance of evidence, entitled to a verdict of 'not proven,' at least. For the little weasel the case is stronger still; the farmer has no better friend, and those who remember the plague of voles which not so long ago caused much damage over large areas of Scotland, will surely agree that here we have a distinctly useful member of the community. It may be noted in passing that few seem to know that in the far north the weasel, like the stoat, becomes white in winter, and is the M. nivalis of Linnaeus. This has also been known to occur in Switzerland, although not in Great Britain. The so-called 'blood-sucking' propensities of this family are now admitted to be altogether imaginary. So much has been recently written concerning the squirrel and its malpractices that it is unnecessary to say more than that it has been abundantly proved to be most destructive in young plantations, and must be kept rigorously down. Sad, too, to say the squirrel seems of late to be developing a vitiated taste for the eggs and young of small birds, of which I have had specific proof. Mention has already been made of rats and voles, but a plea must be recorded for the water vole, usually and wrongly called the water rat. This pretty little creature, more of a beaver in miniature than a rat, is a vegetarian and must be classed as innocuous, excepting in the rare cases where his tunnelling may endanger the embankments of streams or reservoirs, or where in severe winters he causes damage to the osier-beds by barking their shoots. Turning now to our British birds, we find a long list against whom sentence of death, even to extermination, has been ruthlessly decreed. That grand bird the erne, or sea eagle, is already gone as a breeding species; his congener, the golden eagle, survives in some numbers owing to the protection accorded to him in some of the larger properties in the north, and such is also the case with the peregrine falcon. It is sad that one cannot say the same for the osprey. One after another of its former stations have been cruelly robbed and harried, so that it is to-day doubtful whether the osprey may still be retained in our list of British breeding species. The kite, too, with the exception of a very few in Wales, watched and guarded day and night, is gone, and so also are practically the harriers. Of those of our birds of prey still remaining to us, the common buzzard is certainly deserving of protection. Feeding chiefly on moles, mice, voles, the smaller reptiles and insects, the good service it renders may well be placed against a very exceptional delinquency in the shape of a young rabbit or hare. In quite as great a measure is this the case with the kestrel, whose graceful hovering flight as it pursues its constant hunt for mice and voles forms so interesting a note in our country landscape, yet to how many of our keepers are these useful birds merely 'hawks,' and therefore to be slain at sight? One would think that it would hardly be necessary to put in a word of defence for our owls, yet how often do these, too, hang in the keeper's museum in pitiful if mute protest against ignorance and incompetence? For the raven one would merely say that it were a pity that so grand a bird should be exterminated, but the hooded or carrion crow is a nuisance, with difficulty to be kept within bounds, coming as they do in flocks on migration from the north; and the jackdaw of late years appears to increase so rapidly that there, too, a stringent check seems called for. Two others of the Corvidae, the magpie and the jay, are each so beautiful an addition to our woodlands that, in moderation, they surely repay the little they cost. The rook question is a much larger one. In some quarters their increase seems to have passed all bounds of moderation. They have also developed new and unpleasant habits and appetites, hunting and destroying nests and eggs like their near relatives, the crows. On the other hand, their good deeds must not be forgotten, and the conclusion seems to be that the true balance in numbers must be sought for. 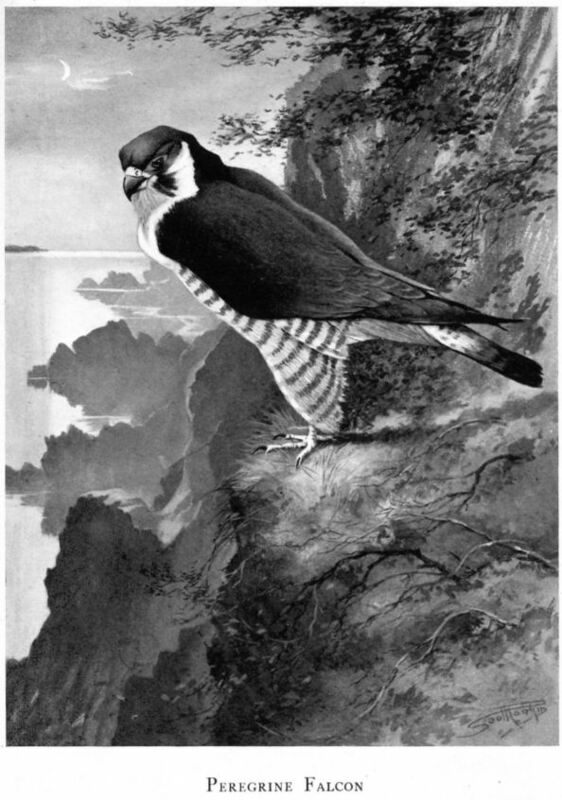 The sparrow pest is another subject of much interest to agricultural and gardening readers; if the gamekeepers would spare a few of the sparrow-hawks, and such lovely summer visitors as that fine little falcon the hobby, it would help; but as things are at present, the only remedy seems to lie in the way of co-operation and destruction. Much more might be written on the balance of nature and man’s constant interference, but the above may, perhaps, serve to cause some who have the power of life and death over these creatures to pause and weigh the evidence more carefully before irrevocable sentence is pronounced. It is pleasant to know that there is already a marked improvement in this direction among the more intelligent keepers. Within a few miles of where these lines are written, the peregrine, the buzzard, the raven and the badger all breed yearly, and one can but hope that, before long, such will be the rule and not the exception.